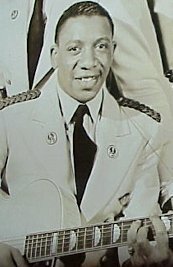 "When You Come To The End Of The Day"
Above Left: Circa 1942 photo of Charlie Fuqua, who was an original member of The Ink Spots, but split off and formed his own Ink Spots group in 1952. 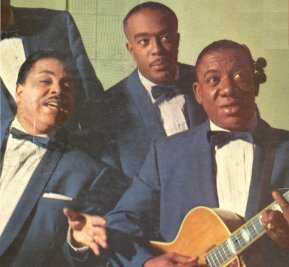 Above Right: Circa 1956 photo of (L-R) Jimmy Holmes, Harold Jackson, and Charlie Fuqua, three of The Ink Spots who recorded for King (and also Verve). Not shown are Essix Scott, Leon Antoine, and Isaac Royal (pianist), who also performed on the King releases. Above Left: Recorded 7/11/54. 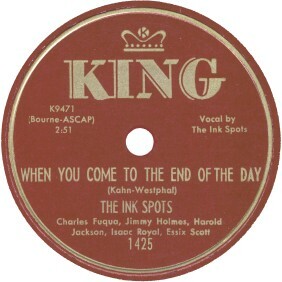 Their seventh of nine releases on King (1953-55). This is a very well done version of the 'Decca' Ink Spots' 1947 release. Above Right: Recorded 7/11/54. Issued in the U.S.A. on King 1378, the group's fifth release on King. 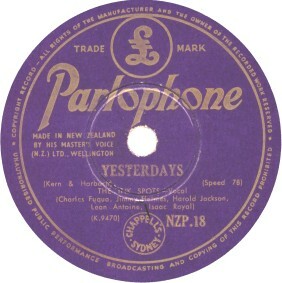 Parlophone was "pressed in New Zealand by His Master's Voice (N.Z.) Ltd." (who pressed for "the six world famous labels of H.M.V., Columbia, Decca, M.G.M, Parlophone and Regal Zonophone"). Somehow, Parlophone must have obtained the rights to this King material. Note that the group members shown on the two above labels are different, although the sides were recorded on the same day! Click on an option below to listen to "When You Come To The End Of The Day" using RealPlayer. Click on an option below to listen to "Yesterdays" using RealPlayer. FOR ANOTHER SIDE BY THE INK SPOTS ON KING LABEL, PLEASE CLICK "HERE IN MY LONELY ROOM".